A system of hair loss classification is a useful way to help doctors compare patients. The Norwood Classification is the most commonly used for male pattern baldness. There are two basic patterns, the most common of which is where hair loss starts in two different areas – the temples and the crown of the head. 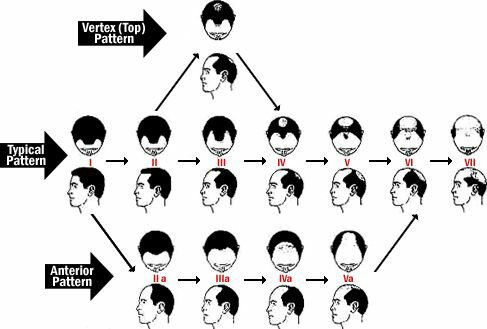 Less common patterns feature the hair loss progressing from the front to back. Non-genetic hair loss from other causes usually follows a completely different pattern again.